A Bangladesh court on Tuesday issued an arrest warrant for former Prime Minister and BNP leader Begum Khaleda Zia over an arson case during an anti-government protest staged about two years ago. Magistrate Joynab Begum of Coomilla district court issued the orders on Tuesday against Begum Zia and 48 other opposition members. Police claimed Begum Khaleda Zia and the others were responsible for the attack on a bus that killed eight people in 2015. Legal experts in Dhaka claimed it is unlikely that Begum Khaleda Zia would be arrested because she often obtains legal protection from the High Court or even the Supreme Court. The BNP has also not issued any statement on the arrest warrant. 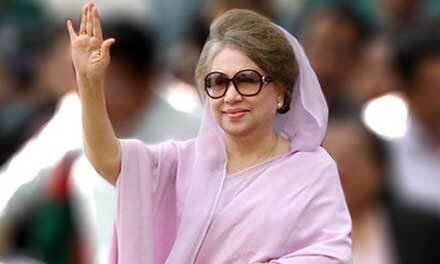 As political revenge is part of the political theatre in Bangladesh, Begum Zia is facing more than a dozen criminal cases in the country. Though the BNP claims that the cases are politically motivated, all the legal battles are crucial because if she is found guilty even in one case, she would be ineligible to contest any national election.